Saudi-based developer Tanmiyat Group said the work on its $100-million flagship project - The Court Tower - in Dubai, was progressing well, with 83 per cent of the project already completed and set for handover by this October. The Court Tower, a premium mixed-use community, will comprise residential apartments, shops and offices on the Dubai Water Canal. Once complete, it will offer residents a full view of the 6.4-km man-made water canal and will also offer easy and quick access to Dubai Roads and Transport Authority (RTA) water taxis, bus stations and metro, said a statement from Tanmiyat. Offering panoramic and unobstructed views of the canal, The Court Tower will add 280,000 sq ft of office space, 198 apartments and 28,000 of retail space to the Water Canal, it added. Since Beijing Emirates Company was appointed as the new contractor for The Court Tower, the project has not only progressed at a fast pace, but is shaping well to be delivered on time. Located opposite Habtoor City and JW Marriott, The Court Tower is more than 80 per cent sold and is open to offer its final floors of commercial spaces to premium brands that will associate well with the property. Delta International Real Estate is the exclusive marketing and sales agency for the project, bringing highest possible returns to the developers and investors, it added. Saleh Tabakh, the spokesman of Tanmiyat’s management board, and CEO of Delta International Real Estate, said: "We are extremely pleased with the developments made on the project to date. 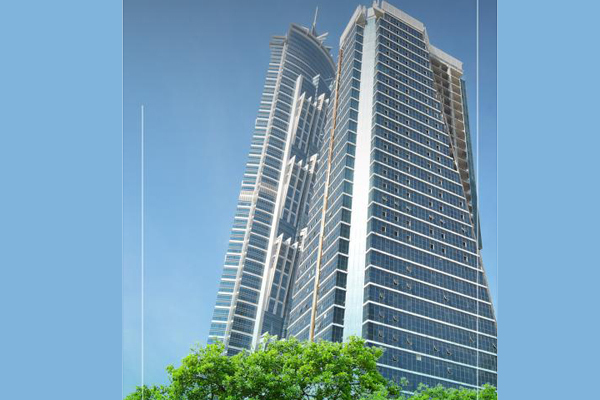 At Tanmiyat Group, we have always been committed to offering impressive and outstanding facilities to our investors. To that end, we’ve been working closely with our contractor to deliver the project on time as well as support the long-term economic and social development of the country." “Once complete, The Court Tower will be our second successful project in Business Bay after delivering the Exchange Tower in 2016. The UAE has always been a major destination for investors from emerging countries to Russia. The way the market is shaping, we look forward to investing in more emirates across the country,” he added. Tabakh pointed out that the group's investments in the UAE had surged to over Dh7 billion ($1.9 billion). "Once The Court Tower is ready, we aim to deliver two more buildings at Living Legends to grow our delivered portfolio to 500 villas, 188 offices at Exchange Tower and 600 apartments at Living Legends," he stated. The Court Tower will not only offer residents tranquillity, but also business spaces, allowing people to live and work in one location. The aim is to reduce travel time to work and help minimise the UAE’s carbon footprint. The Court Tower is one of many mixed-use properties developed by Tanmiyat Group; the company is also developing another mixed-use community called Living Legends at Dubailand, which is spread over 15 million sq ft, said the top official. "It is a premium project, however, its prices are still extremely competitive, which has led to 80 per cent of the project sold at such an early stage. We are confident that before the delivery, the project will be 100 per cent sold out," remarked Tabakh.